I read Glow with my heart caught in my throat, flipping pages frantically and waiting for the sick feeling in my stomach to evaporate. Even after having finished this book, though, my heart hasn’t found its way back to my chest; I find it hard to breathe. For all the trouble it gave me, however, Glow has been one of the most satisfying novels I’ve come across this year. 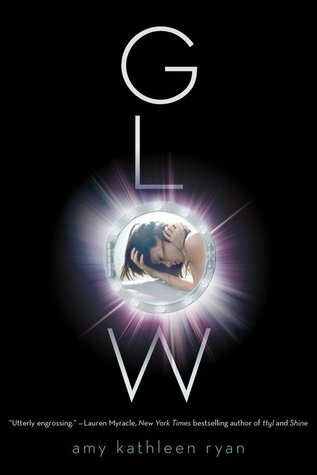 Amy Kathleen Ryan’s unapologetic prose and savage characters are the unpretentious realities I seek in a thought-provoking novel and, if nothing else is guaranteed, it is this: Glow will turn your mind inside-out and force you to re-think everything you thought you knew about humanity. I had a feeling you would like this! You're right that it's a very mature and deeply disturbing read. It honestly took me by surprise, I expected just another Across the Universe-type story. And I also agree that there are strong feminist undertones, which I appreciated greatly. The second book was even better for me, to be honest, but the ending left me gasping. Flame should be out soon, fortunately, so I'll finally get some answers. Wow Keertana! I really hadn't given this book much consideration, but now after reading your review I find myself wanting to move it to the top of the TBR pile! I love books that really make me think and make me question, those are the ones that always stand out as memorable:) So glad you came out of this book with a new favorite author! I've had this one on my wishlist, but you have really moved it up that list! I love books that make you think and I'm curious about the darkness in the story. Oh I didn't think it was this good! You make this one sound fantastic! I thought it was another fun space adventure, but clearly it is not. I like that this book pushes boundaries and explores darker morality themes. I also love whenever characters are complex and multifaceted. However, it does sound rather triangle-y. Tho maybe the 3 characters aren't all on the same ship? If this is pat of a trilogy, maybe I'll wait unit the final releases to decide whether to start. Oh and that stressed out stomach in knots feeling is exactly what I felt while reading When the Sea is Rising Red. It also has a very unique love situation, and some more serious themes. Though the second in the series is even better. Wow, Keertana! I've had this book forever but never got around to it, because I remember most of the reviews being pretty middling. I may have to pull this out and read it asap after seeing your review. Thank you! Keertana, can I just say, your reviews are magic? Every time I come here, your reviews (whether positive or negative) are always thoughtful and prolific. I could probably get lost in your reviews all day, but unfortunately, life gets in the way; still, the glowing ones encourage me to put the books on my wish list right away. This review is no exception. I want to know more about the dark world Ryan has created in space. I want to know more about the complexity of the characters and the issues with morality they have to face. This series has all the makings to be something I will love. I need to get on it.